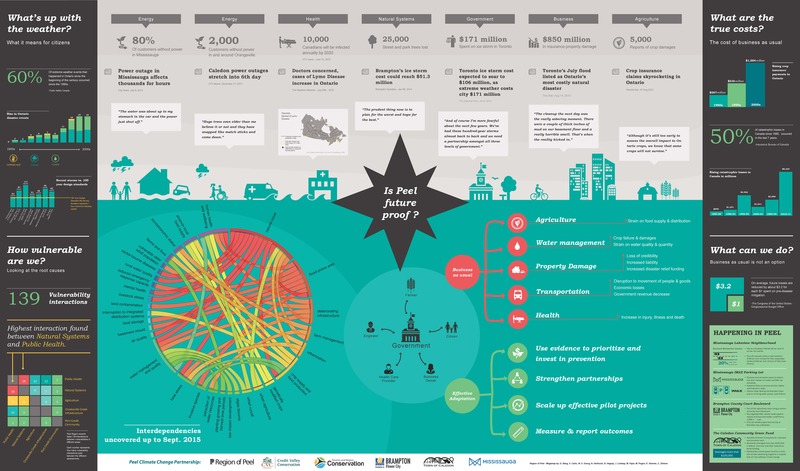 The Peel Climate Alliance needed to synthesize multiple data-rich climate change vulnerability assessments and present the result to the region’s council for resources allocation and prioritization. The members of the Alliance had several competing priorities and too many messages, resulting in inefficient communication with decision makers. By taking Alliance members through the Megamap process we were able to agree on prioritization criteria, identify the target decision makers and their profiles, distil messaging, and visualize relevant data in a large Megamap to be presented to various decision makers. To achieve project objectives we began by taking participants through a foresight workshop in order to communicate possible features and use such foresight as basis for negotiating common prioritization criteria. Working with a joint team of the Alliance and rLab, we identified the critical target audiences and their characteristics. We then put the key messages proposed by each member of the Alliance through an evaluation process and facilitated a reduction in the number of messages. This process resulted in a few strategically important messages which satisfied all members. We then visualized pertinent data in a large synthesizing Megamap, including the profiles of the target audiences, the agreed-upon key messages, and the rich data collected by the member organizations. This Project was implemented as usual with a joint team including members from rLab and all Alliance members.